The A2B Journey passed by the MacDonald Highlands through Henderson, Nevada. Today’s route ended with a short run alongside the River Mountains Loop Trail. 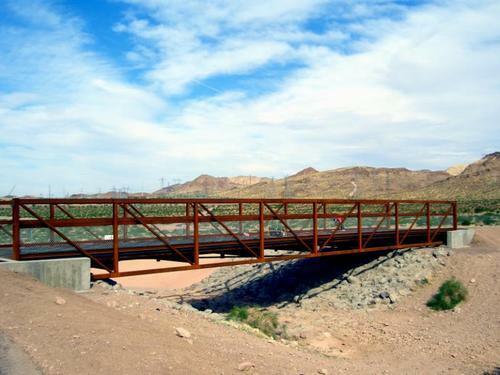 This trail, 35 miles in length, surrounds the River Mountains connecting Lake Mead National Recreation Area, Hoover Dam, Henderson, Boulder City and the rest of the Las Vegas Valley. The trail is partly paved for runners, road bikers, and hikers. 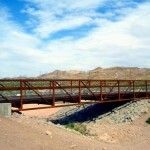 Other trails are specifically designed for equestrians and/or mountain bikers. I did an evening run with a different group than normal. These runners use a different course in the art district. I wanted to try it out. When I arrived, I saw some familiar face from the weekend “long run” that the running club sponsors. I also made a few new friends while stretching. This 5 mile route is very flat and presented little challenge, other than having to stop for traffic every now and then. The fun part of this run was the people and the colorful scenery, sounds, and smells throughout the course. Everything on this run reflected the strong bohemian culture of this neighborhood, including the homes, yards, restaurants, shops, clubs, etc. Even many of the runners sported unique and interesting styles. It made me wonder where people find such creative and clever running gear. I barely noticed the run while taking everything in. Before long, I had completed the loop with the other runners. I think I will come back to this group run every so often just for the experience of it. I did miss the fun and laughter of my regular running group and the un-ending roll of hills on that course. While stretching before the run, I noticed that one of my friends had a tattoo of the Ragnar logo on his ankle. (Ragnar is an a 200 mile overnight running relay race held in various locations throughout the country.) I asked about the tattoo and the race. I mentioned that it must have been a good race for him to which he replied, “Not Really.” Others in the group soon joined in the conversation. Somewhere in the middle, he mentioned that had gotten the tattoo while waiting for his part of the race to begin. I found that odd. But the conversation soon turned to other subjects as we continued stretching. Then, for whatever reason, my mind returned to my friends tattoo as we started the run. I wondered why he got it before the race. It seemed a little like getting a girl’s name tattooed across your chest before the first date (and quite possibly, the last). Before long my mind moved on to enjoy the artistry of the area. I am amazed at what people can visualize and create. I do not have this gift. But I have been close to people that do. Running in this part of town reminds me of them. I appreciate the opportunity that local residents here have given to others to enjoy the world in a more colorful way.